Imagine floating on top of a cappuccino. That’s kind of what it’s like to ski or board the legendary, airy powder in the Canadian Rockies. • Good to know: You’re spoiled for choice with ski resorts in Alberta. Wide open runs and uncrowded ski lifts may be so exciting you'll forget you're on the world's best dry and powdery snow. 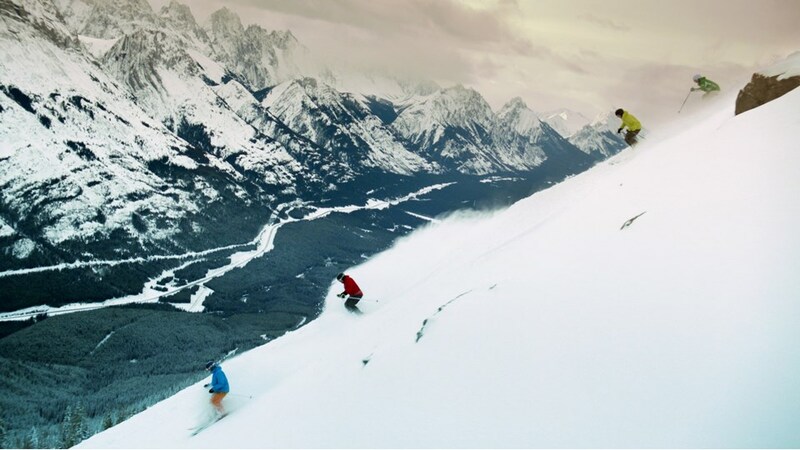 • Try it: Leave the resorts behind and book a backcountry trip. The pure white slopes are just begging for your attention. • Level up: Take a helicopter with some pals and cut into that untouched alpine marshmallow fluff. Make it a multi-day heli-trip with a stay in a mountainside lodge. Skip the lines, feel the thrill of fresh tracks and discover what it’s like when the mountain’s just for you. This holiday season, give the gift of an Alberta experience and create new memories with your loved ones. With so many choices, you’re sure to find something for everyone on your list. Here are some ideas to get you started. Snow Valley’s true calling is to get people up on snowboards or skis and prepare them for riding in the mountains. It is a ‘teach’ facility and they do it very well. All instructors are nationally certified through either the Canadian Ski Instructors Alliance or the Canadian Association of Snowboard Instructors. If you've never been on a pair of skis or a snowboard, or are eager to learn more, Snow Valley Ski Club offers 8 runs over varied terrain and is a great place to gain confidence. There is nothing like the unique sensation of sliding on snow. It’s also perfect for regaining the skills lost over the ‘off season’. There are two carpet lifts, a triple chair and possibly the world’s only ‘high speed pulse quad chairlift with a downhill unload’! The entire hill is groomed daily and the terrain park is raked and groomed daily with banks, boxes, rails and more for the free style crowd. Volunteer and Paid Patrollers are sentinels of safety on the slopes of Snow Valley. The day lodge features a fully equipped tech shop, licensed concession, a rental ski fleet featuring Elan skis with snowboards from Burton, Nitro and others. Night skiing is available Monday to Friday. Some say that they know when Snow Valley Ski Club is open when they can see the lights from the Whitemud Freeway as they cross Rainbow Valley Bridge. Access is through the south entrance of Whitemud Park where over 200 free parking spaces await. Immediate access to the lodge and hill. Castle Mountain Resort is a hidden, not so little gem of the Canadian Rockies. Often called the best kept secret in the Rockies, the mountain was founded in 1966. More than 50 years later, Castle is lauded for its superior ski / snowboard terrain, laid-back community feel and, most of all, its sense of authenticity. Boasting almost 3,000 vertical feet of some of the longest continuous fall lines in North America, Castle is spread out over two mountains, with 94 + in-bounds trails and bowls, serviced by 7 lifts. The resort also boasts one of North America’s only resort based cat-ski operations; the Powder Stagecoach. From family cruisers, to the infamous steeps of the South Side Chutes, to wonderful tree skiing, Castle Mountain has terrain to satisfy every guest and every ability level. The Nakiska Ski package includes two adult lift tickets per night, complimentary shuttle round trip from hotel to Nakiska, and ski storage. The package also includes hot breakfast for two adults. Guests can dine in Forte, Market Café or In-Room Dining. Restrictions apply. This package includes overnight accommodation in Jasper (upgrades available) and a lift ticket to Marmot Basin. Valid for midweek stays only. Price is per person, based on double occupancy. Some restrictions apply. Marmot Basin in Jasper National Park is the perfect place for your next ski vacation. This package includes overnight accommodation at the Fairmont Jasper Park Lodge, two adult ski-lift tickets for Marmot Basin, daily breakfast and ski shuttle. Min. 2-nt. stay required. Taxes and fees extra. KPOW! (Kananaskis Powder) No lift lines! Just you, your snow cat ,and 13 others exploring Fortress Mountain. With annual snowfall amounts of between 8 and 11 meters Fortress gives you a great chance of virgin snow! Aster Mountain Adventures is a small tour company offering guided hiking, backpacking, climbing and backcountry skiing adventures in the Canadian Rockies. Contact us to arrange a tour customized to your preferences. We also offer scheduled interpretive hikes on 'Glaciers and Climate Change'. These hikes are offered at two locations - Wilcox Pass, near the Columbia Icefields and the Iceline Trail. Learn all about how glaciers have shaped our landscape in the past and at present, and what the future holds for glaciers in the Canadian Rockies. Alpine Air Adventures specializes in rock climbing, ice climbing, alpine climbing, backcountry skiing and snowboarding, avalanche courses and improvised rope rescue courses. Fully certified IFMGA Mountain Guide and ACMG Guides. AAA offers a variety of private and course based adventures to suit all levels of adventurer. The Spring Concert Series is back at Banff Sunshine Village. Starting every weekend they'll be jammin’ with bands from all around Canada performing on the Pepsi stage. Join them in the Coors Light beer garden at the Mad Trapper's Saloon. Each weekend, the Pepsi stage will host a different artist playing on Saturday and Sunday in the afternoon. So, grab a seat, grab a beer, and relax while listening to live music in the heart of the Rockies. Who's bringing the fun and live music to Sunshine this spring? April 20-21: Dungarees, April 27-28: Tim Hus, May 4-5: Scenic Route to Alaska, May 11-12: Liam Duncan, May 18-19: To be announced. As always, all Untracked Concerts are free with your Banff Sunshine Pass or lift ticket. Say hello to the Easter Bunny on Easter weekend. They will be hosting an egg hunt and their bunnies will be handing out chocolate and treats to the kids. On Saturday, meet Mr. and Mrs. Bunny in the Village from 11 am to 2 pm. Join Mr. and Mrs. Bunny for a special Egg Hunt at the top of Strawberry at 11:30 AM. In celebration of Canada's Best Spring Skiing, Banff Sunshine is bringing the snow to Downtown Calgary. Yes, you read that right. They will dump tonnes of “Canada’s Best Snow” on Stephen Avenue. Join them for a taste of the Snow Life. They'll have freestyle riders showing off their freestyle skills, Rockstar Energy Canada give-a-ways, and high-fives for all.